To add multiple teams at once, follow the steps given below. 2. Select the Bulk Add option from the New Team drop down list. The New Team dialog will be displayed. 3. Select the name of the sport from the Sport drop down list. 4. Select the name of the division from the Division drop down list. 5. Select the name of the season from the Season drop down list. 6. 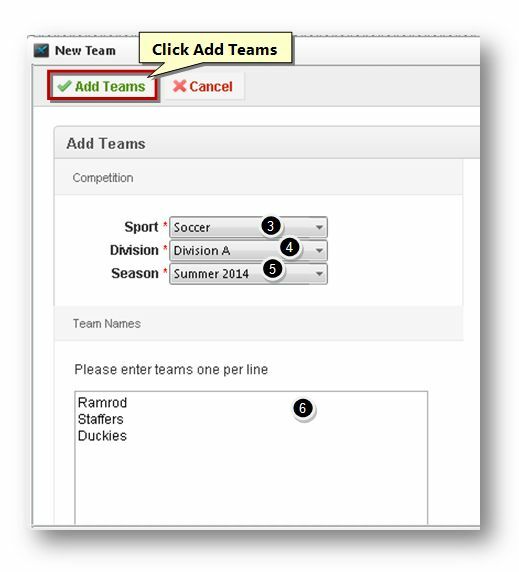 Enter the names of the teams in the Team Names text entry box. 7. Click the Add Teams button. The multiple teams will be added.